When thinking about the overall concept of Succot, just imagine a harvest festival and you won’t be too far off track. But if you dig a little deeper, you'll find that Succot also commemorates a period of wandering during a time when the Jewish people spent many years living in the desert in temporary dwellings. And with that in mind, building a Succah is a great way to celebrate the holiday. So, what is a Succah? Traditionally, a Succah is a structure similar to a hut. During this time of year, it is meant to be used for eating meals, spending time with friends and family, and even sleeping in (if you should feel so inclined). The more makeshift the building looks, the closer you'll be to tradition. A Succah is meant to feel handmade, so don’t worry at all if things look a little rough and ready. This is the kind of project where everyone can spend time together and have some fun. It's really a great project for the whole family. Children will especially love the creativity that comes with building a Succah. Here are some simple guidelines to get you started, with a little extra information on the meaning behind some of the traditions. 1. Basic structure. Many people build a Succah onto the sides of their houses, as the structure needs to have solid walls. This is mainly because Jewish law requires a strong shelter that can protect you from the outdoor elements. 2. Roofing. What makes a Succah distinctive is its roof—that's what it's all about! According to Jewish law, the roof of a Succah must be open enough to let the stars shine through. It should also be made of something organic; so in other words, it should be something that once grew from the ground. Ideas for roofing materials can include bamboo, tree branches or slim planks of wood. 3. Decorating. It isn’t compulsory to decorate your Succah, but for many, it’s a custom that people really enjoy. It’s also considered a good deed or a mitzvah to decorate a Succah, and since it is symbolically meant to be your temporary home for the next seven days, it’s a nice idea to decorate it. This is the fun bit, after all. And if you enjoy getting your creative juices flowing, then why not go all out and make your Succah a real showstopper? Hang garlands of fruit, such as bunches of grapes or citrus fruits. Also, vegetables such as squash or small pumpkins can be strung together and hung on the ceiling and walls. Tip: choose seasonal options to keep up with the harvest festival theme, and consider choices that won’t perish too quickly as they’ll need to last for seven days. Make strings of dried pasta, origami or paper chains. Thread together garlands of leaves and foliage. Dangle artificial stars from the ceiling, perhaps made from paper and painted, or cut out of cardboard and covered with tin foil. Hang pictures and posters on the walls that represent the general theme of the festival. Together they symbolise a unified person. Each of The Four Species represents a body part. The Lulav (centre palm branch) represents the spine; the Etrog (citron) represents the heart; the Aravah (willow) represents the veins and/or arteries (because of the red stem of the willow) and lips (shape of the leaves); and the Hadassah (myrtle) represents the eyes (shape of the leaves). To symbolise that all Jews are one People. Any product made of the five types of grain: wheat, oat, spelt, barley and rye. Any grape or wine product. 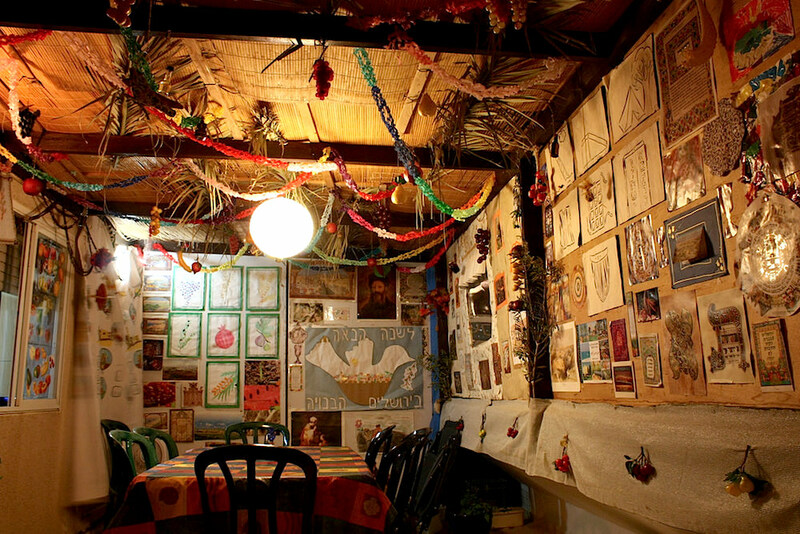 Full meals are encouraged to be eaten in the Succah, but snacks are not compulsory. In other words, enjoy your breakfast, lunch and dinner under the stars, but don’t worry about rushing to your Succah every time you fancy a biscuit or a packet of crisps! On the other hand, you may want to observe the spirit of Succot—but in a simpler format. These next suggestions may bend the more traditional laws of Judaism, but sometimes, it's not so easy to follow all specifications to the letter. After all, not everyone is keen on heavy lifting and construction! Use a room in your house that has a hint of an open roof to it. Perhaps you have a conservatory or semi-glass covered extension; or maybe an upper floor of the house has windows built into the eaves where the sky can be seen. Basically, you want to get the feel of being under the stars! Simply enjoy an al fresco dinner. Succot commemorates the 40 years the Israelites spent wandering the desert. It’s also a festival about the celebration of life as well as the harvesting and growing of crops. For those reasons, a simple meal under the stars (in the absence of a Succah) could be a wonderful acknowledgement of the festival’s history. There’s no obligation to build your own Succah. If you have a friend who’s building one, just pop over and break bread with them! Ultimately it's the gesture you make that counts, and if it’s only a simple nod to the occasion, then there's no reason why you shouldn't still be able to enjoy the spirit of Succot. If you’d like to find additional information on some of the more specific traditions that go into the building of a Succah, here are some resources that we hope you will find helpful. You can also find more information on Jewish festivals throughout the year on the Jewish Care Interact website. If you'd like to learn a traditional song that’s sung during Succot, visit our Songbooks!